It's a long shot, but I'm wondering if anyone has a prototype version of any of the original trilogy Spyro games. This obviously doesn't include the publicly available demo versions - I'm looking for anything, be it alphas, betas, review copies etc. I'd be most interested in a Spyro 3 prototype, for example like the preview copies sent out to IGN back in June 2000. US or UK/EU copies are both acceptable though US ones would be more likely to be an earlier version of the game. Of course, knowledge or evidence of the existence of said prototypes, even if you can't provide me with them, is still better than nothing. Frankly I'm just desperate at this point hahaha. So theres a gent that has a "prototype" of the first game, has made videos about it and everything, but there is literally nothing different from it and a final copy of the game, so I'm inclined to believe they're lying about having it. They wont show the disc, they wont rip it, they wont do anything but have the videos (which are the final game - but i dont even believe it to be a review copy) and their word be their "proof". It's very very unlikely anyone has these prototypes outside of the devs as they did a very good job of not letting content leak (think Rare, but better), and still do. I'm with you in that I want to see some show up, but it's one of those things that may never happen unless we get really really lucky. Thanks. Not sure I've heard of that prototype / "prototype". I have seen two different prototypes of the first game but one of them has a hell of a lot of differences from the final game. The other one seems to be pretty much the final game with a few tiny differences here and there. 3. Final boss level is named differently. 4. Rare bugs where you cannot get all gems. 5. Some of the dragons you pickup do not have in-game cut-sequences, only text pops up. You clearly do not know the game well enough to spot these differences. You then took the opportunity to call me a liar, which I feel is very unfair judgment. Spyro Betas are rare, it's likely most were destroyed as the owners may have assumed they didn't work. I do agree it looks pretty much final, so it's not worth much. There is another known Spyro Beta which is earlier than mine, also shown on YouTube. I received the disc under exceptional circumstances. I'm one of the very few people who are able to crack dongle protected PS1/PS2 games. I was told to do it, I did it and uploaded some videos for everyone to see, that's it really. Nobody ever asked to see a picture of the disc, nor are you entitled to it. I'm not here to convince you, I genuinely don't care what you think but don't go around trying to paint me a bad picture and I won't need to defend myself. I hope you learn from this and do not falsely accuse people in the future. nullChar and AntDRAG like this. Damn right I learned from this. Had no idea you were the person at all. My apologies for the accusations, but it's something I've been bugged by for a number of years and had no resolution about. In fact I did send a few PMs over youtube regarding it some years ago but never got a response (which I can only assume now is due to that being a feature that's nearly non-existent). At least now I finally get a reply regarding it, just wish it wasn't after stirring up a bucket of unneeded anger. My apologies to the OP as well for derailing this. No need to apologise, I completely understand that due to lack of information/differences you may have suspected the build to be fake. As for PMs, I get flooded with them on YouTube regarding other things. I try to respond to everyone but sometimes it's not possible. I dug through the PMs and noticed only two were left unanswered about Spyro. I'm not sure if either come from you due to the different usernames though. No worries though, it will definitely be released sometime You're not missing out on much! It would actually embarrass me to release such a game close to the final build. Woofmute, sa1, hwd405 and 1 other person like this. i'm very interested in it, i'm currently working on a level editor for the first 3 spyro games. i love beta's, looking for differences and hacking them. Even if the build in question is nearly identical to the final release, there could very well be some older data not found in a final copy, like that one debug OoT cart that guy found a while ago. Looking forward to seeing you release it and seeing what people can find inside! I doubt there's been any developments but I'm bumping just in case! I feel like 90% of my life is devoted to Spyro prerelease and prototype stuff right now, lmao. There's a good amount of original Spyro trilogy demos in the wild from different regions, might be worth trying to hack. I know, I'm the one that's been documenting and hacking them lmao. Looking for a full prototype ideally, or something like the E3 2000 demo if it still exists. I feel like I saw a Review Code PS1 disc (PAL) not terribly long ago on ebay - or maybe elsewhere. It's an official sony Review label (unlike the one above), but they're usually near final build anyway. Are those the the black and gold discs? 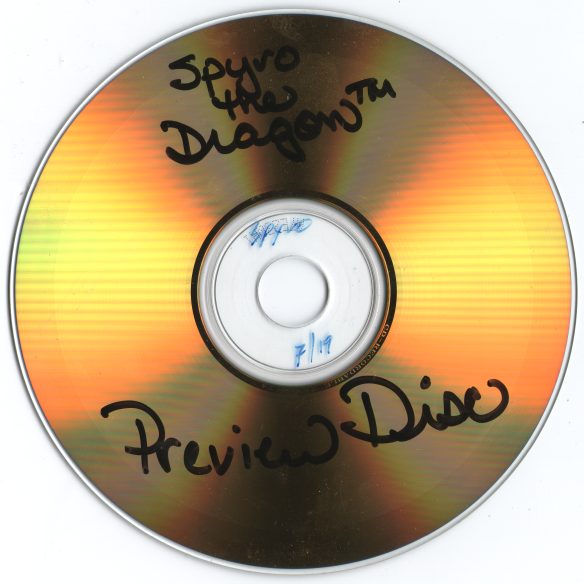 I've not come across any Spyro review discs like that. I did see one a few years ago that was on an ordinary CD but I don't think the owner is interested in selling it anymore. Bumping. Quite a few preview builds of these games were sent out to reviewers but a lot of the information on these builds has sadly been lost to time. I've no idea how many of these prototypes have survived the test of time, and even if they have, actually locating them is another thing, but I've always got my fingers crossed. Bumping. More footage of the Gamespot prototype has come to light and it's really fascinating. I hope that version of the game resurfaces eventually, if it even still exists. There's not all that much to see but this iteration of Sgt. Byrd's theme really stands out. This video's been on Gamespot for years but due to the video player not working it was impossible to watch unless you downloaded the file directly. There's other videos that were on the site in the past but since they were deleted a while back they're impossible to access now, so I just hope someone out there still has them. Finding out more about this version would be ideal because I want to confirm my hypothesis about its placement in the development timeline (there is evidence in the earliest demo to suggest that the demo came before this version, but it's hard to be certain). http://www.gamespot.com/videoembed/2593459 Movie 2, still there, invalid format though and I'll guess its the one you just linked? That's right, yeah. Movie 2 can be downloaded directly from http://video.gamespotcdn.com/d3/gsc//spyro3_2_700.flv but I had to run it through a video file converter to get it to work. As for the others, no luck. Doesn't seem to be any trace of them on the Gamespot api and there's no way to change the link to one of the other video files without getting "file not found".